Inside Americas gateway to the universe. Leading the world in preparing and launching missions to Earth and beyond. April 5, 2002John F. Kennedy Space Center Spaceport Newshttp://www-pao.ksc.nasa.gov/kscpao/snews/snewstoc.htmVol. 41, No. 7 Pages 2,5  Recognizing Our People honors the Expendable Launch Vehicle team and Lead Vehicle Manager Kelvin Manning. Winners of Environmental & Energy Awards, Snoopies and FEW scholarship are named. Pages 3-4  The 2002 KSC Picnic delights families, friends. 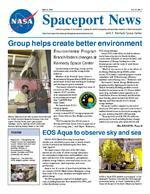 (See BRANCH, Page 6) Group helps create better environmentEnvironmental Program Branch fosters changes at Kennedy Space CenterSynchronizing technology, energy and the environment may seem like an impossible endeavor. Members of the Kennedy Space Centers Environmental Program Branch (EPB), however, spend much of their time tackling the challenge and showing the goal is attainable. Our branch achieved an impressive array of successes in 2001, which supports KSCs position as an organizational leader in environmental stewardship, said EPB Chief Diane Callier. The branch leads KSCs energy program. NASA Headquarters recently reviewed KSCs energy program and gave Center Director Roy Bridges a positive report. KSC became the first NASA center to develop and obtain Center Director approval of a 5-year energy plan, said Wayne Thalasinos, KSC energy manager. Current KSC-wide efforts include an alternatively financed project in Shuttle facilities, conservation initiatives in various facilities, and Department of Energy funding for a solar thermal project and the study of wind-driven electricity generation. Much of our success is due to the efforts of the Energy Working Group (EWG), which ensures KSC makes continual progress towards compliance with Federal energy efficiency mandates and reducing costs, Thalasinos said. The branchs Shuttle Energy Modifications program retrofits lighting and controls in the Vehicle Assembly Building, modifies several facilities for inclusion on the LC-39 area chilled water loop, and makes major upgrades at the Solid Rocket Booster Assembly and Refurbishment Gacility, which include both HVAC and lighting, said Chris Ianello, KSCs Shuttle energy manager. The project will be complete by the end of fiscal year 2002 and is expected to save at least 7 million kilowatt-hours in electrical consumption per year and more than $375,000 annually. The proposed cost of $2,489,702 will completely pay for itself including finance charges within a ten-year term, after which NASA willEOS Aqua to observe sky and seaManny Cabrera (front left), project technical lead for NASA Ground Systems Division, Dan Hull (right), Florida Power and Light project manager, and a lighting-retrofit electrician discuss lighting design ideas in the VAB.NASAs EOS (Earth Observing System) Aqua satellite was scheduled at press time to launch aboard a Delta II vehicle from Vandenberg Air Force Base, Calif., April 26. The major science objectives of the EOS Aqua mission are the study of cloud coverage and properties, atmospheric temperatures and humidities, trace gases and areosols in the atmosphere, precipitation, rediative energy balances, terrestrial snow, sea ice, sea surface temperature, land vegetation, and ocean productivity. Aqua is one of a series of spacebased platforms that are central to NASAs Earth Science Enterprise a longterm study of the scope, dynamics and implications of global change. The EOS program is composed of multiple spacecraft, including Aqua and T erra (launched in 1999), and a data distribution system.NASAs Aqua-EOS satellite is processed in the Spaceport Systems International (SSI) payload processing facility on South Vandenberg AFB. Aqua will be part of the Earth Observing System. SPACEPORT NEWS April 5, 2002 Page 2 Silver Snoopy Awards Recognizing Our PeopleMike Benik holds the Rotary National Award for Space Achievement, the Stellar Award, which was given to the KSC Expendable Launch Vehicle Project Management Team.KSCs Expendable Launch V ehicle Services directorate was recently chosen to receive the prestigious Stellar A ward presented at the 2002 Rotary National Award for Space Achievement ceremony. This award recognizes outstanding individuals and teams from government and industry who have made significant contributions to the future of Americas space program. The award was presented at the 16th annual National Space T rophy award dinner, a formal banquet held at the South Shore Harbour Resort near the Johnson Space Center. Mike Benik, director of ELV Launch Services, traveled to Houston to accept the award for the Kennedy Space Center expendable launch vehicle team. The Stellar A ward was presented to Benik by a pair of veteran astronauts, Pamela Melroy, who flew on STS-92 and is now in training for STS-112 in August, and Dr. James Reilly, mission specialist on STS-89 and STS-104. KSC was selected in recognition of successfully consolidating all ELV program and project functions from other NASA centers to KSC in 1998. An effective team was assembled at KSC to perform the technical management and government oversight of the launch service providers under contract for launch of NASA scientific, planetary and astrophysics spacecraft. The team performed these functions with a launch manifest two to five times the average of earlier manifests. The team was also recognized for having innovative engineering expertise in the development of effective technical procedures, policies and programs. The exceptional management implementation resulted in the safe, reliable and timely launch services for 23 NASA scientific missions with a high level of customer satisfaction. Six different types of expendable launch vehicles were used from five different launch sites. There were 30 nominees and KSC was selected as one of five to receive the S tellar A ward. Employees of the MonthELV team wins Stellar AwardWilliam Dunn Space Gateway Support Sheryl Cooper Space Gateway Support Lois Reinhart Space Gateway Support Dennis Reddecliff Space Gateway Support Dann E. Oakland NASA, Spaceport ServicesEnvironmental & Energy AwardsSSPF/Central Heat Plant Natural Gas Reduction Michael Cressy, Boeing John Clark, Boeing Douglas Thom, Boeing Dwayne Geiger, Boeing Donnie Baxter, Boeing Ed Hardy, Boeing Fulin Gui, Boeing George Broyles, SGS Jim OMalley, UB Propane Reutilization Dave Lambert/SGS Andy Anderson/SGS Freddie Furman/SGS John Martin/SGS Krytox Oil Recyclin g Dave Hall, Wyle April Employees of the Month are (seated from left) Johnny Mathis, ISS/Payloads Processing; Charlotte Beauchemin, Safety, Health & Independent Assessment; Dan Mangieri, Workforce & Diversity Management; Sheryl Marshall, Spaceport Services; Richard Carrillo, Shuttle Processing; and Pat Jordan, Chief Financial Office. Not shown are Larry Craig, ELV & Payload Carriers Programs, and Alan Littlefield, Spaceport Engineering & Technology. Page 5 SPACEPORT NEWS April 5, 2002 Nows the time to try to get some recognition for your one-in-a-million manager. The Florida Space Coast Council of the National Management Association is sponsoring the Brevard County Manager of the Year award and is seeking nominations. The award highlights the NMAs objective to develop and recognize management as a profession. The award will be presented during Management Week June 3-8. The nominee must be of the highest moral and ethical principles, have a record of continuing achievements professionally and in the community, have made a significant contribution to the success of an organization/profession, demonstrate top management skills and community leadership, and be recognized for a reputation of fair, impartial, and ethical management in dealing with subordinates, peers and associates. Submit your nomination of 2000 words or less, describing why your leader deserves the honor, to FSCC Awards Committee, attn: Violet Smith, P.O. Box 21214, Kennedy Space Center, FL 32815; e-mail vedward@bv.net; or FAX (321) 853-6020. It must be received by April 12. For more information, call 321-427-6563 or e-mail. Kelvin Manning laudedThe Space Coast Chapter of Federally Employed W omen (FEW) recently sponsored a special scholarship for the FEW 2002 National Training Program. Pamela Krueger of Space Gateway Support at Kennedy Space Center was the winner of the scholarship award. It consists of registration fees for the training program and lodging. The program is to be held at the Rosen Centre Hotel in Orlando July 2326. The scholarship was open to all NASA and Contractor personnel and was awarded at the chapters 23rd Annual Training Seminar in March. Kruegers community and volunteer activities at Gardendale Elementary and other schools, her work-related special honors and awards, and her essay on benefits she anticipates gaining from attending, the training program were outstanding The chapter congratulates her and looks forward to her attending the NTP.Krueger wins FEW scholarshipNominations sought for Brevard Manager of YearKelvin Manning, lead vehicle manager and Atlantis vehicle manager, is more than a bit modest about his recent national honor. It was a humbling experience, Manning said. Its not just about me. I realize that the whole Atlantis team makes me look good. My wife, family and friends have offered tremendous support. Manning and his Atlantis team were in high gear at press time. Atlantis was scheduled for the STS-110 Mission launch April 4. Manning was honored Feb. 16 as the 2002 Black Engineer of the Year Award for Outstanding T echnical Contributions in Government. The award was presented at the 16th Annual Black Engineer of the Year Awards Ceremony at the Baltimore Convention Center. Manning said he found the presentation to be doubly sweet because Baltimore is just 23 miles from his hometown of Aberdeen, Md. His family members from that area were able to attend the ceremony. The award was sponsored by the US Black Engineer & Information Technology Magazine the Council of Engineering Deans of Historically Black Colleges and Universities and the Lockheed Martin Corp. The ceremony was sponsored by Daimler Chrysler and featured a variety of government leaders and corporate executives as presenters. Manning was nominated for the award by Michelle Amos, chairperson of the Black Employee Strategy Team (BEST). His nomination came with full Center support, especially from the Shuttle Directorate. Kelvin is an amazing leader and were proud that hes a part of our KSC team, Amos said. In her nomination letter she said: For more than five years Kelvin has shown that he is technically competent to manage the unique and complex systems of Space Shuttle ground processing. Kelvins strong interpersonal skills allow him to effectively collaborate with and manage a diverse group of more than 100 engineers and scientists throughout the space program. His dedication to safety and effective communication helps ensure that astronauts have the best and safest vehicle possible. Manning has served his entire career in the aerospace industry beginning with a stint in the Air Force. He got an early start in leadership training as an Eagle Scout and still volunteers to encourage youth with the Boy Scouts of America, as well as BEST. After graduating from the Air Force Academy in 1981, Manning was assigned to Eglin Air Force Base in the Florida panhandle. There he maintained a catalog of all Earth-orbiting objects in the Alternate Space Surveillance Center Later he worked at the North American AerospaceKelvin Manning, lead vehicle manager and Atlantis vehicle manager.Defense Command (NORAD) inside of Cheyenne Mountain in Colorado Springs, CO where he ran a team of orbital analysts calculating satellite orbits and providing NASA with Space Shuttle collision-avoidance data. He also reported the teams predictions for external tank impacts and provided critical support for the recovery of lost satellites. Afterwards as a civilian, Manning worked for GE Aerospace, Military and Data Systems Operations in Springfield, V a., and later with McDonnell Douglas in Washington, D.C. writing preand post-mission reports for senior NASA managers, assisting in development of contingency action plans and the like. In 1992, Manning started with NASA KSC in the Shuttle Processing Directorate and has moved steadily up the ranks to his current position. Each year USBE awards candidates like Manning whose qualifications and performance place them in the ranks of the nations highest achievers in technology. The three-day Black Engineer of the Year Awards Conference is Americas premier celebration of African-American success in engineering, science and technology. Antonio W atson, conference chair explained the importance of the award: For many of the winners, the award is special because it makes them role models for thousand of young people and inspiration for thousands of their peers. These honorees are more than role models, leaders, and professionals on the cutting edge of technology, they are hard working stakeholders in their organizations, proud to stand before the technical community as examples of boundless possibilities. Mannings status as a role model will come in handy with the new addition to his family. He and his wife, Judy recently were blessed with their first child, David. This is an especially rewarding time in our lives, Manning said. Page 6 SPACEPORT NEWS April 5, 2002 John F. Kennedy Space Center Managing editor. . . . . . . . . . . . . . . . . . . Bruce Buckingham Editor. . . . . . . . . . . . . . . . . . . . . . . . . . Kathy Hagood Editorial support provided by InDyne Inc. Writers Group. NASA at KSC is located on the Internet at http://www.ksc.nasa.gov USGPO: 733-133/60005Spaceport News Spaceport News is an official publication of the Kennedy Space Center and is published on alternate Fridays by External Relations and Business Development in the interest of KSC civil service and contractor employees. Contributions are welcome and should be submitted two weeks before publication to the Media Services Branch, XAE-1. E-mail submissions can be sent to Katharine.Hagood-1@ksc.nasa.govBRANCH ...(Continued from Page 1)retain 100 percent of the energy savings, he said. The branch has developed two environmental and energy award programs to recognize government and contractor employees who have contributed to the successful preservation of the environment, and conservation of energy and natural resources. The Catch an Environmentalist Award is given throughout the year to recognize individuals and teams in a timely manner. The Environmental & Energy Award is given to individuals and teams biannually by the Center Director. March and September ceremonies are held to honor winners. (Please note that recent winners of the award are listed in the Recognizing Our People section on page 2. Other biannual award honorees in various categories will be listed in future issues of Spaceport News .) Another recent achievement of the Environmental Program Branch was removing the source of ground water contamination at the Paints and Oil Locker and working on it at the Component Cleaning Facility. Farther afield, the branch was tasked to study a colony of threatened birds that nest near a Vandenberg Air Force Base launch complex. Concerns about the potential impact of launches on the nesting birds led to the study. The KSC team studied the overall population of various birds that might be found on the site to determine if their presence might have adverse impacts to the population as a whole. The study helped reveal that the group of birds represented a fraction of the regional population and that the species of concern has made better than a five-fold increase in the population, said Mario Busacca, technical lead, planning and special projects,. The KSC group also determined that the NASA launches have not made any adverse impact on the long-term survivability of the species. The first Light Management Plan for Launch Complexes 39A and 39B saved KSC energy and money. Lighting at both pads resulted in sea turtle disorientation. After analyzing existing light configurations, energy usage was reduced by 123,250 watts with an annual cost savings of $32,390. Plus turtle disorientation was reduced. NASA and the Air Force collaborated to revise the KSC Environmental Checklist. Both agencies will use the joint document to accomplish initial environmental reviews of proposed projects and activities and to speed processing and ensure uniform reviews regardless of a projects location. Not only is the team working behind-the-scenes, but they take a more high profile stance to educate employees. The 2001 Environment and Energy Awareness Week (EEAW) event held in April of last year, which included more than 70 vendors, drew more than 3,000 workforce participants. According to Callier the branch plans to continue their devotion to improving KSC. The 2002 EEAW, scheduled for April 22-24, is just one example of that dedication. She said, The branch staff plans to use the EEAW as an opportunity to communicate and interact with KSC NASA and contractor staff to continue improving staff knowledge and appreciation of their respective individual and organizational roles in environmental stewardship and leadership at KSC. For more information on branch activities, including EEAW, visit http://environmental.ksc.nasa.gov/. In the Vehicle Assembly Building, a lighting retrofit electrician works next to an External Tank (ET) to retrofit 1970s vintage lighting hardware on the ET test stands with the latest, energy efficient technology.Lighting at both pads resulted in sea turtle disorientation. After analyzing existing light configurations, energy usage was reduced by 123,250 watts with an annual cost savings of $32,390. Plus turtle disorientation was reduced.